Mérida is the capital and largest city on the Yucatán Peninsula, and is also the region's vibrant cultural heart: rich in colonial history with its graceful plazas and far reaching cuisine choices, but also beating with traditional colour in the narrow streets and bustling markets. And you're close to the peninsula's ancient treasures and the beaches and resorts of Quintana Roo. It is the kind of city with something to offer every budget and is the ideal destination for a romantic break. The best places to stay in Mérida will make you fall in love with this exciting artistic city. Mérida's Plaza Grande, the historic centre, is where you'll find a lot of the little shops and cafes, but it also hosts regular markets, concerts and performances. This is also where you'll find the severe, square cathedral, the Museum of Contemporary Art, the Governor's Palace and stonework reclaimed from the ancient Mayan city upon which Merida was built. The downtown area is also where you'll find the hostels and inexpensive restaurants, while the more boutique offerings and elegant restaurants are in the city's north. Mérida retains a wonderful colonial feel, partly due to the jungle setting and architecture, and partly from the climate - it's tropical, so people get most of their work done in the morning, take long siestas in the afternoon and come back in the evening when the cooler breezes roll in off the Gulf of Mexico. Nowhere is Mérida's grace and elegance more obvious than on El Paseo Montejo, a romantic street upon which to stroll of an evening. One of the other great places to be is the Plaza Grande on Sunday evenings when the whole area around is closed to traffic and there are bands and free concerts and street vendors keeping everyone satiated and refreshed. Escape the hustle and bustle of the city by visiting the beautiful and stark cathedral in the city centre. Walk through the market on Plaza Grande! Check out the Museum of Contemporary Art. Go for a romantic stroll down El Paseo Montejo! Head towards the downtown area and enjoy the countless bars and chic cafes. Merida is the ideal place for a romanic break: teeming with great art galleries, romantic walks and lovely old markets, you will find yourself lost in bliss. Check out our collection of the best places to stay in Merida to find out more! Rosas & Xocolate (Chocolate and Roses) is a themed property, converted from two beautiful mansions. The conversion is luxurious, and the themes run all the way to the chocolate spa treatments. Great for couples. 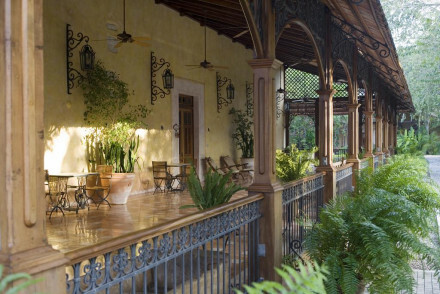 The Hacienda San José is a stylish jungle escape with a world class spa. 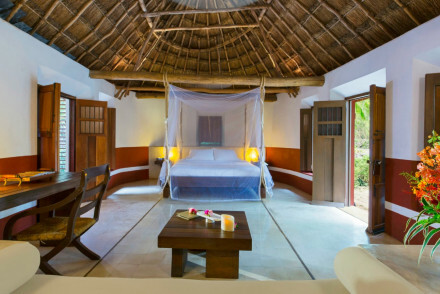 Accommodation is in a collection of 11 rooms and four very private villas. The villas have private jacuzzi pools and hanging double beds. 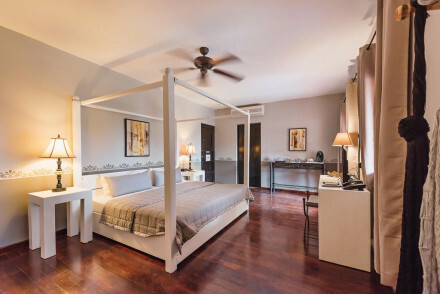 Coqui Coqui: a stylish one-room boutique with a balcony overlooking a courtyard, offering an ornate and indulgent room, royally-elegant, with a pampering spa and Parisian cafe. Adults only. Perfect for a romantic break. 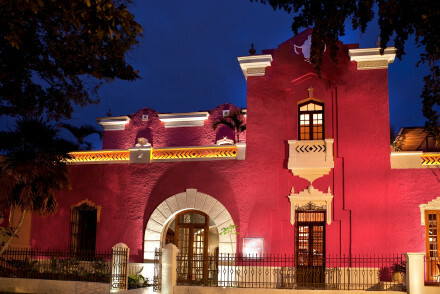 Hotel Hacienda Mérida offers fabulously stylish accommodation just a short walk from the main square. A traditional exterior belies contemporary interiors plus a bar and two pools. Mérida’s small international airport, the Aeropuerto Internacional de Mérida, is about ten kilometres outside of town. At the moment you can’t fly direct from the UK, and will need to change in Mexico City. Mérida’s weather doesn’t change too much throughout the year, it’s always pretty hot, with daily average maximums rarely dropping below 30ºC, and peaking out at about 38ºC during the warmest months, May, June and July. And there’s not much rain outside the rainy seasons which are October through January and April through July. September is nice and quiet, and January and February are very pleasant too, though Christmas and New Year are also among the most popular times to visit. 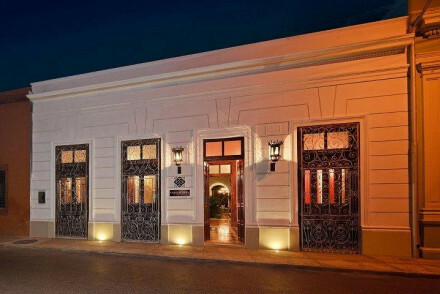 Unlike its traditional facade, this hacienda, located in the heart of Merida is contemporary in style. There is a bar and a chlorine-free pool. Whilst only breakfast is served, you are stumbling distance from the bars and cafes of Plaza Mayor. Book early for the balcony rooms! Casa Lecanda is situated in central Mérida. It offers smart rooms with high ceilings, tiled floors and large bathrooms whilst there's also an outdoor pool-perfect for a refreshing dip to escape the heat! Visit the wine bar and enjoy international cuisine in their restaurant. A superb city choice! A beautifully renovated Hacienda situated just outside Mérida. Well proportioned rooms are traditional in style with high beamed ceilings, antique furniture and tiled floors. Boasting two freshwater pools, a fabulous spa and renowned gourmet restaurant. Close to many Mayan ruins. Superb. Spa breaks - A glorious spa offering holistic treatments using indigenous herbs, flowers and honey. Local exploring - Well located as a jump off point for exploring Mayan ruins. Sights nearby - Explore the Mayan cities of Uxmal, Chichen Itza, Dzibilchaltun and Yaxunach. Birdwatching - Find over 100 species at the mangroves in the Celestun Nature Reserve. Uniquely themed hotel made of two converted mansions. 'Chocolate and Roses' run throughout the property, from the simple but attractive decor to the chocolate spa treatments. Also offers a luxury range of amenities such as spa, gym, restaurant, breakfast in bed and swimming pool. A quirky delight. Spa - Unique cocoa paste used for facials and massage. Swimming Pool - Interior courtyard pool. Hidden amidst thick jungle find an absolute treasure of a property. A small boutique hotel painted mustard yellow. Enormous rooms are traditional in style with high ceilings, whirring fans and four poster beds. A superb spa is utterly spoiling and the pool completely tranquil. The perfect hideaway. Hideaway - A small boutique property nestled in the jungle. Diving - Dive in Mayan sacred cenotes for an unforgetable experience. Sights nearby - Make a trip to the ‘yellow city’ of Izamal. 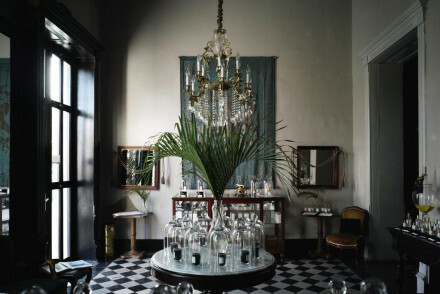 A majestic one room boutique, sitting above a famed perfumery in Mérida’s Centro Histórico. You will feel like royalty in this indulgent suite, with a balcony overlooking the courtyard, it is gilded and glittering, without feeling overdone. The cafe and bar are relaxed and Parisian in feel. Superb.